As I walked home from shul this past Shabbos with my son Shalom, we were reminiscing about our family trip to Eretz Yisroel a year ago. Shalom expressed that he was disappointed with “Eretz Yisroel”. He felt that it was somewhat of a letdown. He had seen so many pictures and heard so many stories about Eretz Yisroel, and particularly the Kosel, and he was expecting the experience to be much loftier and glamorous than it was. I told Shalom that life is often like that. Things often aren’t as spectacular as we anticipate. But more importantly, he wasn’t alone in his experience in Eretz Yisroel, or in visiting the Kosel for the first time. Many people report that same sense of disappointment. They expect to arrive at the Kosel to feel an angelic embrace as they are swept off their feet by their spiritual force that exudes from the holiest place on earth. But instead they find that they are staring at a wall; an ancient wall with greenery protruding from between its stones, and many people milling around in front – some praying, some learning, some collecting charity, some taking pictures with stapled cardboard kippot on their heads, and others talking gregariously on their cell phones seemingly oblivious to the sanctity of the place. The truth is that holiness isn’t something one naturally feels. Feelings of the soul must be developed. One must have a sense of spiritual maturity to appreciate sanctity. In parshas Shemos Hashem instructs Moshe to inform Klal Yisroel that He will soon be redeeming them from Egypt and bringing them to Eretz Yisroel. There the pasuk (Shemos 3:8) describes Eretz Yisroel as a land “flowing with milk and honey”. Rav Shlomo Wolbe zt’l explained that both milk and honey are valuable and necessary commodities but are not immediately accessible. Unlike fruits which are noticeable on a tree and can easily be picked, milk remains hidden in the animal’s utter and must be squeezed. Honey too – whether bee honey or even date honey – must be squeezed in order to attain it. The greatness and beauty of Eretz Yisroel is not necessarily immediately apparent. It is only palpable to one who can appreciate the intrinsic holiness and how invaluable the land is. One needs to develop and foster a sense of spiritual awareness in order to appreciate kedusha. Otherwise it’s just a wall, or an old religious guy with a white beard, or another synagogue where we go to pray, socialize, and have a good kiddush. The difference between inspiration and a wall depends on whether we have the insight to see beyond what our physical eyes see. One of the most prized seforim that I have from my zaydes massive collection is a rosh hashana/Yom Kippur machzor printed in Germany in 1840. I always make sure to use the machzor for part of davening during those holy days. I love the feeling of its ancient yellowing yet thick and strong pages and clear ink, and I like to think about the stories this machzor could tell. But the machzor wasn't printed by Artscroll to say the least. I always chuckle to myself when I get to the words at the beginning of shemone esrei which states, "b'choref (in the winter one adds the prayer): Mashiv Haruach"
As Yom Kippur of course will never fall out during the winter it's a cute editorial oversight. But this week I realized that it's not such a joke. Perhaps Yom Kippur will never fall out during the winter, but this week Tisha B’av did – again! Once again Klal Yisroel is observing a national Tisha B'av out of season. The massacre that took place this week in a shul in the Har Nof section of Yerushalayim, the murdering and maiming of multiple Jews wrapped in their talis and tefillin, has left us all in utter shock. We were sure nothing else could so shock us. After all, by now we have heard of suicide bombers blowing up busses and pizza shops, three yeshiva bochurim killed in senseless cold blood, a massacre in a yeshiva killing multiple yeshiva students over their gemaras, a father murdered along with his daughter who was to be married that very night, the murder of an innocent infant and a pure convert, and the list painfully goes on. And yet here we are again - in shock. People murdered in shul wrapped in Tallis and tefillin while davening? How could it be? We again have nothing to grasp but our faith that Hashem is all good and knows what He is doing, even as we are reeling. Of course when it hits close to home the pain is magnified. 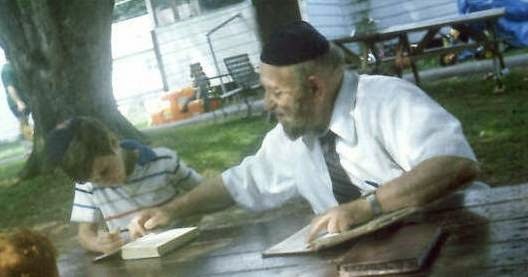 Rabbi Twerski hy'd was a rebbe in yeshivas Toras Moshe, which I attended for a time. Although he was not my rebbe I remember his radiant countenance and how he would lovingly teach Torah to his admiring students. When I looked at the horrific picture of the body of one of the victims draped by his talis with tefillin still wrapped around the listless arm, I yearned to grab the hand and lift it off the ground. I yearned to see that hand again move in prayer, clutching a siddur lovingly. Alas, the hand will move no longer! But I realized that I have the ability to cause a similar hand, also regally decked in tefillin, sway gracefully in prayer while clutching a siddur - i.e. my own hand. I daven each morning, and have the great merit to don those G-d endowed gifts for a few precious moments of prayer each morning. But it's hard to remember how precious those gifts are. I am tired in the morning, and I have a lot of concerns and affairs to deal with later in the day. It's hard to concentrate on davening and it's even harder to awaken within myself feelings of excitement for my talis and tefillin, which I wore yesterday, and the day before yesterday. But that image serves as a painful reminder. I have no doubt that the neshama of that holy martyr would tell me to appreciate what he can no longer do; to cherish those moments and cherish those gifts. Put aside everything else - it will wait! Leave your silly cell phone closed and focus on the davening. Tisha B’av has arrived yet again. On Tisha B’av morning we do not wear tefillin. But in the afternoon we do. We gather solace in the unified mourning and love of our people, and we forge on with faith in Hashem. May the ethereal light of Chanukah arrive early to douse the darkness of the Tisha B’av that came late. May Hashem comfort the mourners, and may Hashem comfort all of us. Next Thursday, 27 Cheshvan will be the yahrtzeit of my Zaide, Rav Yaakov Meir Kohn zt’l. Every year during the weeks before his yahrtzeit I take out the few binders I have containing his sketchy writings containing his Torah thoughts. Many of those thoughts were written in his distinctive (difficult to read) shorthand writing, hastily recorded on the back of any paper that was in his vicinity. So there are divrei Torah written on the back of invitations, bills, letters, and receipts stuck into the pages of his seforim. Zaide also had a tremendous collection of seforim which lined many of the walls of his Lower East Side apartment. My Bubby ybl’c would often complain to him that there was no more room for more seforim. Her efforts were futile however, as he would sneak bags into the apartment and leave them under the dining room table. Then when Bubby wasn’t in the area he would clandestinely move the bags into his study. The week after he passed away two bags full of seforim were found under the dining room table. I have a few seforim from Zaide. Although most of those seforim have been reprinted, those old seforim are obviously very precious to me. The prize of that collection is Zaide’s Kovetz Shiurim. Kovetz Shiurim is a familiar sefer in the hallowed halls of yeshivos the world over. It is a collection of the shiurim of Rav Elchanan Wasserman zt’l hy’d, the great Rosh Yeshiva of Baranovitch who was murdered during the Holocaust. Kovetz Shiurim was first printed in 1964 by the author’s son, Rav Simcha Wasserman zt’l. The sefer I have is from that original printing and has a purple cover. The reason that particular sefer is so special to me is because Zaide was a talmid of Reb Elchanan in the Baranovitch Yeshiva for some time. I imagine him entering a seforim store in 1964 and seeing that the shiurim of his late Rebbe had been collected and printed. I imagine how it brought back memories of his days as a student in the yeshiva and the images of his saintly rebbe delivering those same shiurim. I imagine the bittersweet emotions that seeing the sefer for the first time must have evoked, perhaps even a few tears. When I hold that sefer and I learn from it I feel connected, not only to my beloved Zaide, but also to what he felt connected to – the Torah of a previous generation. This week our family celebrates the birth of our newest nephew, Mordechai Shlomo, born to my brother and sister-in-law, Yaakov and Michal. [B’ris was Thursday morning in Yerushalayim. ]Yaakov is named after Zaide and it is especially meaningful that his son’s b’ris will iyh be this Thursday, 20 Cheshvan, seven days before his namesake’s yahrtzeit. May the newborn baby be a source of pride for our family, and all of Klal Yisroel, as he becomes the newest link in the endless chain of our glorious heritage. Have you ever looked at old pictures of yourself and thought about how different you are than the person in the picture? Life itself is an experience that changes us, whether we like it or not. Recently Chani and I were leafing through a scrapbook chronicling the time we dated until we were engaged. As we reminisced about that time period we realized that we are indeed very different people than we were then. We have shared many incredible blessings, as well as many challenging moments, and we have definitely grown and changed in a variety of ways. Avrohom Avinu lived a life of challenges and tests. According to some commentators the first test was “lech lecha” when he was told to leave his family, friends, community and everything familiar to travel to an unknown destination. The final test was the ‘akeidah’ when Avrohom was instructed to offer his beloved son Yitzchok as an offering on the altar. The Medrash notes that when Hashem commanded Avrohom to perform the akeidah He also utilized an expression of ‘lech lecha’ (“Go to Mount Moriah…”). The Medrash then states that we are not sure which ‘lech lecha’ was greater – the original or the latter. What is the question of the Medrash? How could any test be more arduous and challenging than the akeidah? Tests are not measured only based on circumstance, but also based on who the person is. Two people may be faced with the exact same challenge and yet deal with it completely differently. What’s more, the same person may react differently to the same situation at various stages of life. Although the command to offer Yitzchok upon the altar was an incredible challenge, by that point Avrohom had reached an unimaginable connection with Hashem. He had proven again and again his unwavering loyalty and commitment. At the time he was instructed to leave his family and birthplace however, he had not yet achieved that level of sublime greatness. Therefore, although the akeidah was undoubtedly a more difficult task in and of itself, based on who Avrohom was at that point versus who he was at the time he was instructed ‘lech lecha’ it is not so clear cut which was a greater test. We hear about other people’s predicaments, and about things other people have done or have not done, and we are quick to pass judgment, point fingers, and blame. At times we may feel that we have a right to do so because we faced the same challenge and dealt with it far more adequately. But we forget how little we really know about each other, for our eyes can only see the surface. Beneath the superficial surface lies the depth and essence of people – their proclivities, inclinations, penchants and what makes them tick. We can never really judge others. We may see what they do, but we can hardly know who they really are.